The jobs report Friday set off cheering: a quarter million positions added in December; unemployment declining to 5.6 percent. This good news arrived amid a booming stock market and a third-quarter GDP report showing the strongest growth in 11 years. It’s all so very jolly, except for one looming factor: wages. They’re not rising. In fact, they fell in December by 5 cents an hour, nearly erasing the 6-cent increase in November. Hard-working Americans need a raise. Their wages are stuck, rising only 10.2 percent over the past 35 years. Workers are producing more. Corporations are highly profitable. CEOs, claiming all the credit for that as if they did all of the work themselves, made sure their pay rose 937 percent over those 35 years. That’s right: 937 percent! It doesn’t add up for workers who struggle more every year. Something’s gotta change. The AFL-CIO is working on that. It launched a campaign last week to wrench worker wages out of the muck and push them up. 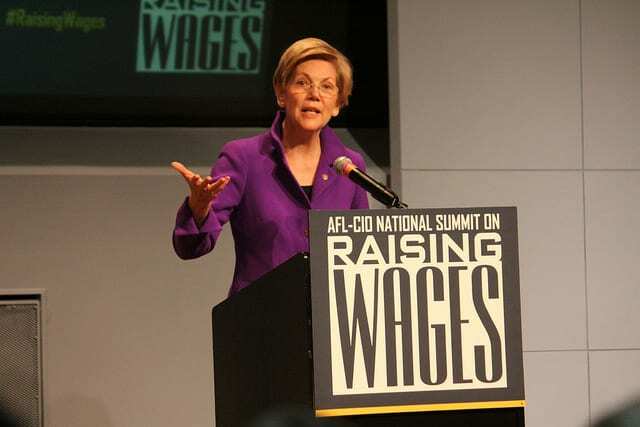 Photo of Sen. Elizabeth Warren at Raising Wages Summit by Ben Wikler on Flickr. The meeting attended by 350 union representatives, community group officials, economic experts and religious leaders was the first of many that will be conducted across the country by the AFL-CIO to spotlight the pain and problems that wage stagnation causes. The AFL-CIO will begin these meetings in the first four presidential primary states – Iowa, New Hampshire, Nevada and North Carolina. The idea is to ensure that candidates, Republican and Democrat, can’t squirm out of dealing with the issue. And Trumka said labor won’t tolerate sappy expressions of sympathy. The federation will demand concrete plans for resolution. Also last week, the AFL-CIO launched Raising Wages campaigns with community partners in seven cities – Atlanta, Columbus, Minneapolis, Philadelphia, San Diego, St. Louis and Washington, D.C. In addition to seeking wage increases for all who labor, these coalitions will pursue associated issues such as fighting for paid sick leave and equal pay for equal work. At the same time, the AFL-CIO and allies will push for federal legislation to seriously punish employers who illegally retaliate against workers and to provide real remedies for workers unjustly treated. At the summit, workers told their stories alongside experts. Among them was Colby Harris, who suffered illegal retaliation. A member of OUR Walmart, he was fired last year after participating in strikes for better conditions. “They are trying to silence people for saying we need better wages and benefits. The average Walmart worker makes less than $23,000 a year. These companies have no respect for their workers,” Harris told the group. Another speaker, Lakia Wilson, said that workers can do everything right, work hard, follow all the rules and still lose out in this economy. The Detroit native earned a bachelor’s degree in education and a master’s in counseling. While serving as a school counselor, she took a second job as an adjunct professor at a community college to make enough money to qualify for a home mortgage. U.S. Sen. Elizabeth Warren talked to summit attendees about why the economy does not work for people like Wilson and Harris. Though this economy is splendid for those who own lots of stock, it’s not for the vast majority of workers who get their income from wages. Sen. Warren pointed out that the economy didn’t always work this way. From the 1930s to the 1970s, she said, workers got raises. Ninety percent of workers received 70 percent of the income growth resulting from rising productivity. The 10 percent at the top took 30 percent. Since 1980, however, that stopped. Ninety percent of workers got none of the gains from income growth. The top 10 percent took 100 percent. The average family is working harder but still struggling to survive with stagnant wages and growing costs. “Many feel the game is rigged against them, and they are right. The game is rigged against them,” Sen. Warren said. The rigging was adoption of Ronald Reagan’s voodoo trickle-down strategy. That economic plot puts massive corporations, Wall Street and the 1 percent first. Politicians bowed down to them, legislated for them, deregulated for them. In return, the wealthy were supposed to chuck a few measly crumbs down to workers. They did not. Workers got nothing. Despite that, workers still get last consideration. That, Sen. Warren said, must be reversed. Accomplishing that, clearly, is a David vs. Goliath challenge. David won that contest, and workers can as well – with concerted action. Papa John’s worker Shantel Walker told the summit such a story – one of victory against a giant with collective action. She discovered that a teenager at the New York franchise where she worked was putting in time that was not clocked. The restaurant was stealing wages. For that to occur, lawmakers must serve the vast majority first. They must stop functioning as handmaidens to the rich in an economic scheme that has failed the 99 percent from the very day the 1 percent got Ronald Reagan to buy it. The AFL-CIO and its allies intend to help lawmakers see that they must prioritize the needs of America’s workers.